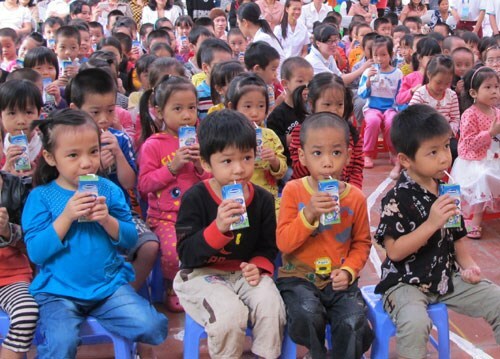 Bac Ninh (VNA) – The northern province of Bac Ninh has decided to splash out more than 420 billion VND (18.5 million USD) on a school milk programme for more than 557,000 pre-school and primary pupils during 2017-2020. Of the total, 210 billion VND (9.25 million USD) will come from the provincial budget, some 105 billion VND (4.62 million USD) by milk supplying businesses and 105 billion VND (4.62 million USD) from parents. Disadvantaged students will receive free milk. Per the programme, pre-school and primary school students will receive three 180 ml milk bottles per week for nine months. In the 2017-2018 academic year, some 139,000 local children, including more than 94,000 pre-school children and 44,000 primary students, will benefit from the programme. The school milk programme was launched nationwide on September 28, 2016. It targets providing all pre-school children and elementary pupils in poor districts with milk by 2020, meeting 90-95 percent of their energy demand and increasing the heights of school boys and girls by 1.5 and 2 centimetres, respectively.